We’d love your help. Let us know what’s wrong with this preview of Asimov's Science Fiction, February 2015 by Sheila Williams. To ask other readers questions about Asimov's Science Fiction, February 2015, please sign up. Wasn't a huge fan of this issue - the only story that really satiated my spec fic appetite was Nick Wolven's. A well-written, polished story set in the'default future' of climate change and radical wealth disparity. Story ultimately didn't jive with me. Too tame. It didn't take any risks or explore any new ideas. A story told from a teenage girl's perspective about an abusive boyfriend who is collared with a pacification device. T Wasn't a huge fan of this issue - the only story that really satiated my spec fic appetite was Nick Wolven's. A story told from a teenage girl's perspective about an abusive boyfriend who is collared with a pacification device. The story could easily have been written without any spec-fic elements, however, which makes it a 'no go' for me. Nothing special. I most enjoyed "Forgiveness" (Leah Cypress) and "Of Rattlesnakes and Men" (Michael Bishop) -- both of which are social commentary disguised as a story. As was the novella by Nick Wolven, but I didn't enjoy that as much. A much better than average issue with a number of fascinating tales by Elizabeth Bear, Eneasz Brodski and Nick Wolven. Michael Bishop's tale, while interesting, is too over-the-top with its tale of a snake-driven cultural that apparently mirrors some aspects of the gun-worship culture in the USA. - "Rattlesnakes and Men" by Michael Bishop: a disturbing tale of a family who moves into a community only to discover a requirement: that every family must have a resident rattlesnake. A somewhat unsubtl A much better than average issue with a number of fascinating tales by Elizabeth Bear, Eneasz Brodski and Nick Wolven. Michael Bishop's tale, while interesting, is too over-the-top with its tale of a snake-driven cultural that apparently mirrors some aspects of the gun-worship culture in the USA. - "Rattlesnakes and Men" by Michael Bishop: a disturbing tale of a family who moves into a community only to discover a requirement: that every family must have a resident rattlesnake. A somewhat unsubtle commentary on a certain other dangerous culture in the US and what it could lead to. - "Ghost Colors" by Derek Künsken: a man is 'haunted' by the ghost of a man (apparently a paleontologist obsessed with the colour of dinosaur feathers) who loved a woman that he knew. There is a cure to remove the haunting but what the ghost and girl shows him about devotion may make him change his mind. - "No Decent Patrimony" by Elizabeth Bear: in a future where the well connected can now live very long lives, an explosion kills one such person. Now his heir has to live with the consequences of a future where the haves can have a long life and are resented by the rest of the population. - "Red Legacy" by Eneasz Brodski: a fascinating story set in an alternate world where the principle of Lamarckism improvement can work, resulting in a race to improve the human race but in different ways. The Soviets want to improve all (socialism), the English to improve only the elite while the Americans embrace Darwinism struggle for existence (capitalism). The story is set in Russia where a researcher is racing to improve bacteria in a secret laboratory that can eliminate radiation in preparation for an expected nuclear war. But she has a side project; to clone and improve her dead daughter who died from cancer. Her struggles to keep her daughter alive and to keep her project alive comes to a head during a battle with American intruders. - "Forgiveness" by Leah Cypess: the story of the relationship between a girl and her boyfriend who, after abusing her, has an inhibitor put into him to inhibit his violent actions. She continues to see him, an action that generates controversy in her community and is a question she asks herself, especially when she discovers that the inhibitor may not be working as expected. A few good ideas, but it had to go for "stylish"
Good! Oppresive, desperate, but solid sf, in an alternate world where Lamarck was right. Meh ghost story. I will look for other Kunsken story that was praised in the intro and won reader´s award. I have a feeling I read this before, or a story with the same setting. What if a chip could induce good behavior? It was also used on Spike in Buffy the VS. I want to read those 4 stories! Interesting issue. "On the Night of the Robo-Bulls and Zombie Dancers" combined Shakespeare, Wall Street, and sleep--or lack thereof. And looks at the line between genius and crazy. "Ghost Colors" was one of my favorites, maybe because the past anchors me in the present, as it does for the protagonist. "Red Legacy" plays with the obession Soviet biologists had with Lamarck, rather than Darwin & genes. Kind of reminded me of my History of Biology classes. A plus was a poem by Jane Yolen! There were a few stories in this issue that I really liked, such as Red Legacy, and Forgiveness. There were a more though that I admit I didn't really understand quite as well as I would have liked to. I liked the Bear story best, the Wolven nextbest. All pretty good, thanks. I liked nearly every story in this issue. I loved the first story and found the book reviews concise and informative. "Forgiveness", by Leah Cypess was exceptional, though not an easy tale to read with its themes. The other stories of this issue I really didn't find too compelling though. A weaker issue, though one with a great cover. 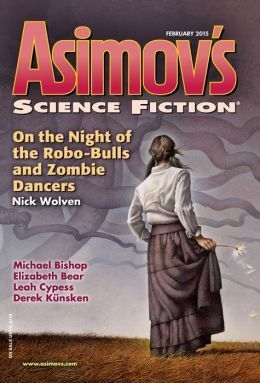 Title story 'On the Night of Robo-Bulls and Zombie Dancers' was pulpy fun, but nothing that will stick with me over time.